Further steps are needed to master the way how to trade stock breakouts. You have already selected the best trading opportunities using screener and then also manual selection. But now you have to continue with next four steps to generate some profits form a swing trade or position trade that is based on a stock breakout strategy. The typical breakout trade setup consists of three major points: the entry price, the stop loss price and possible target price. Now we have to define them to know how to trade stock breakout trades. 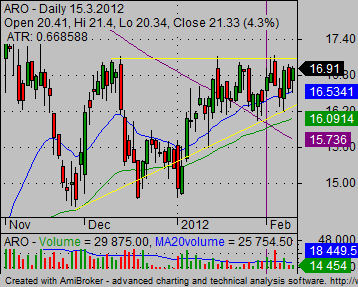 Start with the ARO daily chart that is a good trading opportunity for a bullish breakout swing trade. The entry level should be set above the resistance level seen on the chart. 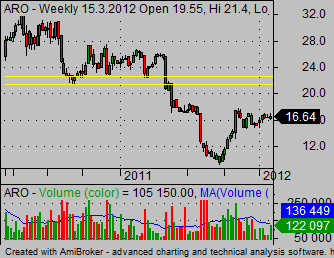 This horizontal resistance level for ARO chart is between 17 and 17.10. So you can up an entry point at the price 17.25. When this price is reached the breakout is probably going to be real and have a big chance to continue up in the coming days. The stop loss level should be set as the second major parameter of any online trade. The stop loss level setting is very individual. Every single ticker has a different price and also trading range that forms under resistance that should be broken. Here on the chart of ARO you can use moving averages as a point where price should not return after a successful breakout of resistance. So a stop loss in this case will be near 16.50 USD. Finally you have to find a possible target for this new uptrend movement. You can use long-term charts with a weekly period to find the next important level of resistance. When you study the long-term technical chart of ARO you see that there is a pretty nicely defined level of resistance in the 22 to 24 area. The lower line could be used as a target for such trade. It is also possible to use a round number as such numbers play an important role in investors expectations so we could set a target near 20 USD level too. As you already have all three key parameters for the trade setup, you have to check risk reward ratio. This ratio should be above 3 to be allowed to do such online trade. This trade setups for ARO shares you have this risk reward ratio above 5 for a target near 22 USD and above 3 for a target at 20 USD. It is a very good trade setup. This is an example strategy setup that helps you to learn how to trade stock breakouts. 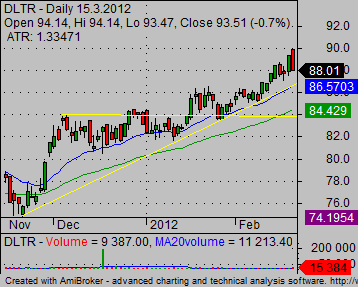 This trade setups in ARO stock looked as a good trading opportunity. Lets check how the situation developed over the next few days and if trade made some money for you. As you can see, the trade developed nicely after the breakout. You were able to enter the trade near our entry point and exit the trade few weeks later near 20 USD level. Now it is time to decide what to do. If your target was at 20 then my preferable strategy is to exit the trade completely. If the target was set at 22 you can prefer to take a partial profit and for the rest of the position apply a tight stop loss. you have not to risk more than you could gain from the current price level at 20.45. Here is another example of a breakout trade. 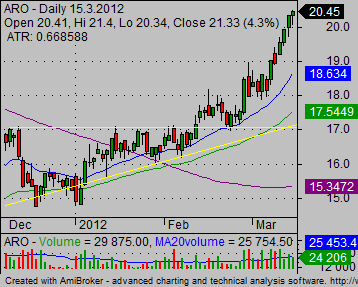 Here is the chart of the DLTR breakout that our screener found as a good candidate for our strategy.